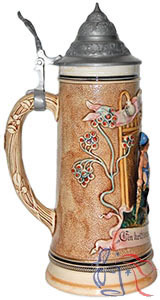 There has been a great deal of speculation about the nature of the scene on this stein, but unfortunately no clear conclusions. Depicting naked students on a beer stein would have been almost unthinkable at the time (c. 1910) and yet there they are. Could it be some sort of student society initiation ritual or hazing? What would make it such a “critical day”? At this point, definitive answers to these and related questions would appear to have been lost to history.